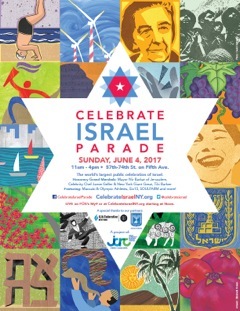 "Celebrate Israel All Together" NYC June 4, 2017. 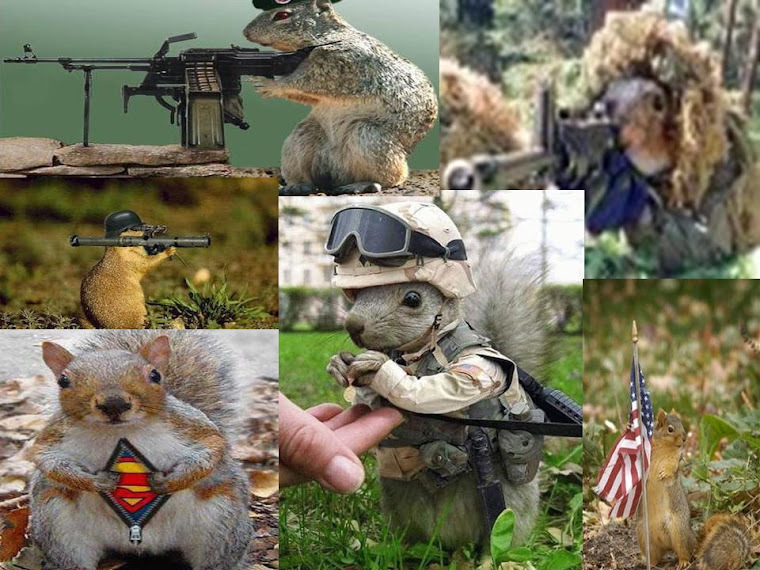 "Together, we are stronger. We encourage and support each other; we celebrate our differences and find common ground; we increase our understanding of ourselves, each other and the world. Our love for Israel unites us throughout history, now and forever! All together, we celebrate Israel!" "The parade, hosted by the Jewish Community Relations Council of New York (JCRC-NY) began in 1965 and this year marked the 50th anniversary of the reunification of Jerusalem. 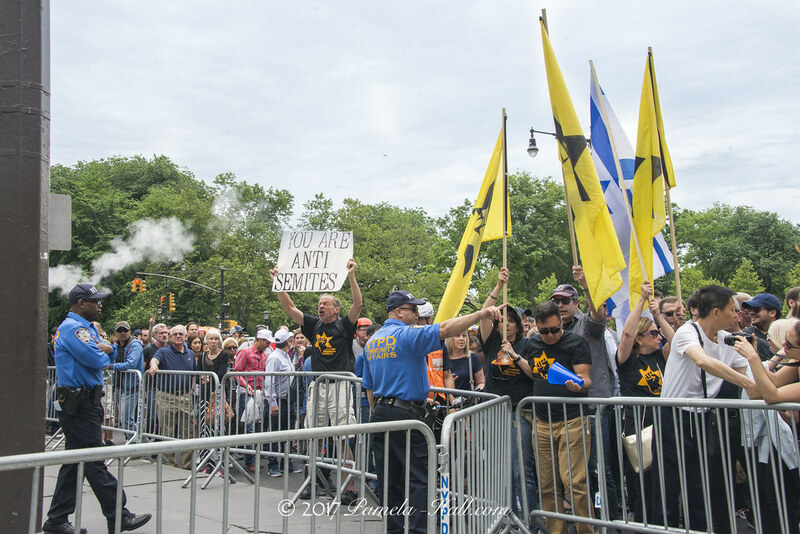 The 2017 parade was led by Gildan Erdan and New York Governor Andrew Cuomo and was attended by dignitaries including members of Knesset, the mayor of Jerusalem, senators and congressmen"
Flickr Slide Show - The parade was joyful but not meek when it came to challenging the RUDE "shills-for-fakestine". More video that includes the JDL as well as other parade goers challenging the RUDE LIES shouted at the families as they marched by. 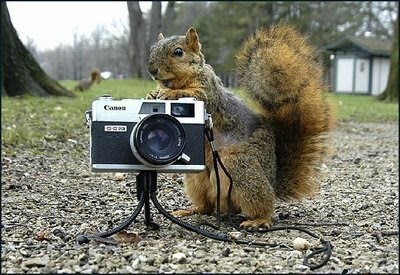 Flickr slide show. The marchers (young and old) and some on the sidelines - like the JDL - did NOT march silently past the obnoxious Progs, Muslims and Neteuri Karta. Then there were the politicians .... Letitia James, Mayor Red Bill deBlasio and the City Council members (who I saw march) - Margaret Chin and Ydanis Rodríguez - who work 24/ 7 for sanctuary city status, free college for illegals and Fakestine. Always there for Fakestine. Opportunists. HYP-O-CRITES. ....the parade showcased cooperation of Israel and New York’s political elites. Bill de Blasio marched alongside Nir Barkat while New York Senator Chuck Schumer, one of New York’s most outspoken critics of Trump and a familiar face at anti-Islamophobia rallies in the city, marched up Fifth Avenue waving an Israeli flag the entire way. My friends at AFSI were also there. Marching. Somehow I never saw them. Disappointed. But, thanks to the full video stream of the parade, I was able to grab a screen shot. 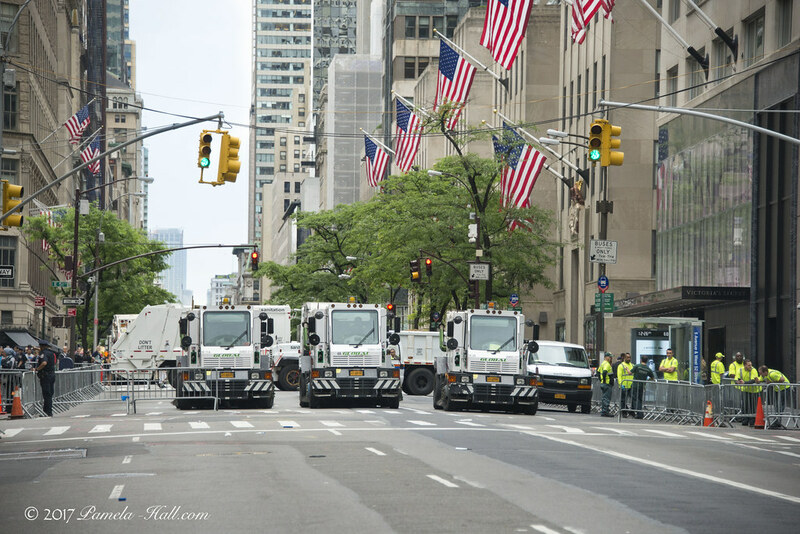 BTW- Thought the garbage trucks post-parade, there were so many, was funny. The streets were CLEAN. As always, the ubiquitous Neteuri Karta droning on about no Israel. 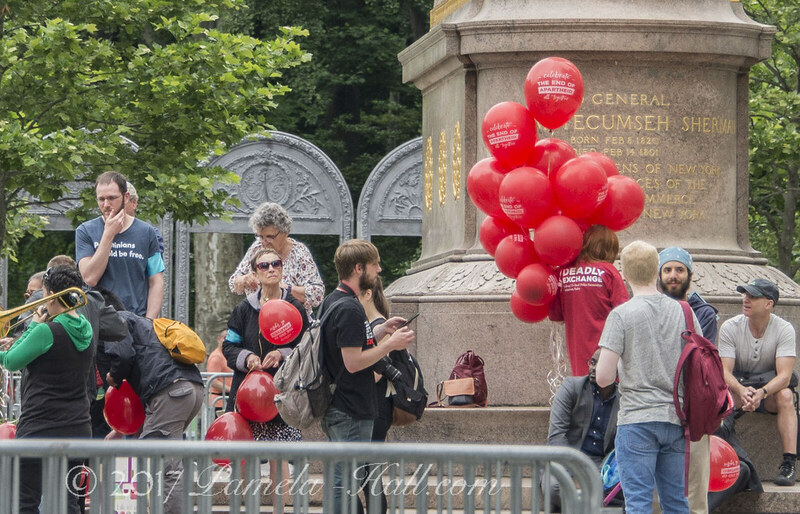 AND the obnoxious red-shirted, music-playing, left-preaching, agitprop show I saw gathering at the Gen. T. Sherman statue; ALL hating on Israel. 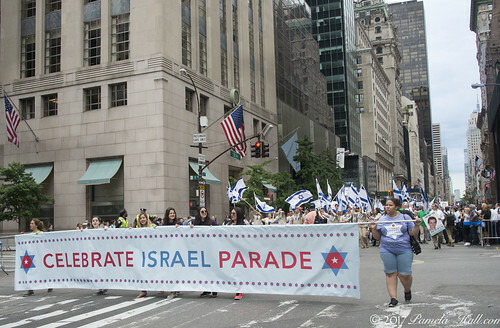 "Fifth Avenue in Manhattan was awash in blue and white flags on Sunday, June 4 as the Celebrate Israel parade kicked off for its 52nd year. This year’s theme according to organizers was “Celebrate Israel All Together,” though the 50th year of Jerusalem’s “reunification” took center stage. But for "Palestinians", the so-called reunification of Jerusalem marks the beginning of Israel’s 50-year military occupation of the West Bank including East Jerusalem." 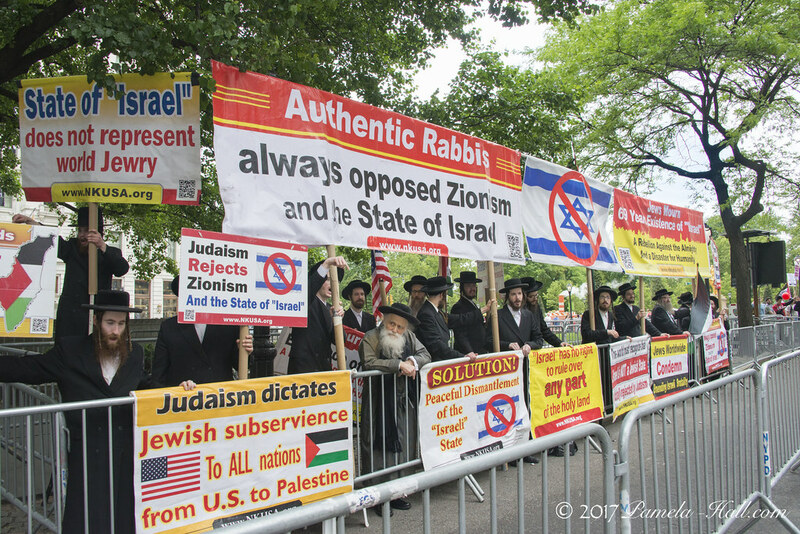 With this in mind, multiple anti-occupation protests halted the parade along its route, resulting in 7 arrests by the NYPD. Members of the JDL refused to speak with Mondoweiss, but yelled things like “Go back to Jordan!” and “There is no Palestine, there will never be a Palestine” as can be heard in the accompanying video." The JDL was solid .... bold and brave. Seven activists arrested throughout the day in a series of protests against Israeli occupation & apartheid on 50th anniversary of occupation...The annual Celebrate Israel parade was repeatedly disrupted by over 100 Jewish activists, including 7 who were arrested for civil disobedience demonstrations that at times stopped the parade’s progress. One group of activists blocked NYC Mayor Bill de Blasio and his contingent, protesting the New York Police Department collaboration with Israeli security forces, an exchange of worst practices that harm communities of color & Palestinians. 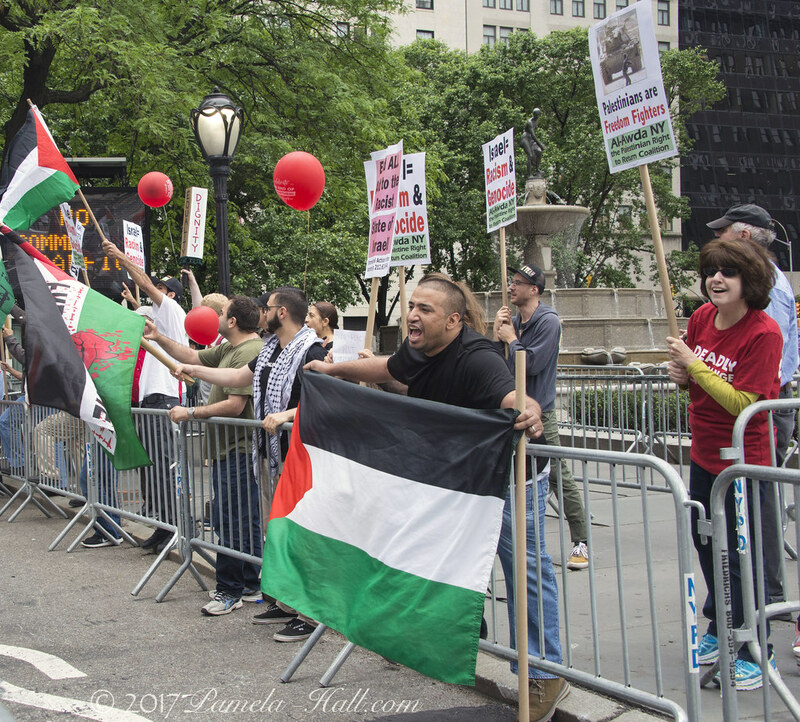 The activists locked themselves together across Fifth Avenue, preventing the Mayor from marching for several minutes with signs reading “Black & Palestinian Lives Matter”, “NYPD & IDF collaborate to kill”, and “End Israeli Apartheid.” Several parade-goers and private security attacked the protesters. Another group of queer Jews staged a sit in disrupting the LGBTQ contingent holding signs saying ‘No pride in apartheid’ and ‘Queer Jews for a free Palestine.’ “We are here as queer and trans Jews to say that apartheid and occupation are nothing to celebrate and that we will not be used by the state of Israel to cover up its violent oppression of Palestinian people,” said Craig Willse, one of the 5 activists arrested in the nonviolent demonstration. Demonstrators with IfNotNow also unfurled a banner across the parade route that read “No Celebration with Occupation,” slowing down the procession. “There is nothing to celebrate until Palestinians have equal rights, until the occupation ends, until there is justice, dignity and equality for all people living in that land,” said Rebecca Vilkomerson, executive director of Jewish Voice for Peace. "Partners for Progressive Israel is dedicated to two equally essential goals: First, the achievement of a durable and just peace between Israel and all its neighbors, especially the Palestinian people, based on a negotiated two-state solution. Partners for Progressive Israel believes that Israel’s ongoing occupation and settlement effort undermine the country’s national interests, sully the image of Zionism, and inevitably lead to the violation of the human rights of those under occupation. Second, and just as importantly, Partners for Progressive Israel is dedicated to the realization of human and civil rights, equality and social justice for all of Israel’s inhabitants – regardless of ethnic/religious identity, national origin, gender, or sexual orientation. The mission of Partners for Progressive Israel is to generate and promote partnership between Israelis and Americans who support a progressive Israel. Based on the notion of a common people hood, we focus in particular on partnership and collaboration between American Jews and their Israeli counterparts in order to help create a more progressive Israel and Zionist movement. Towards this end, Partners for Progressive Israel educates American Jews, and Americans generally, regarding the issues of peace, democracy, justice, and equality in Israel and the territories it controls. Just as importantly, Partners for Progressive Israel develops and implements hands-on programs that enable the American Jewish community, and its friends, to provide real support for policies of peace, democracy, justice, and equality in Israeli society." "Advancing democracy and equality for all Israelis. Provide critically-needed support to hundreds of national and community-based organizations working to safeguard civil and human rights, promote religious tolerance and pluralism and narrow economic and social gaps in Israel." "Congregation Beit Simchat Torah ("CBST") is a synagogue located in Manhattan, New York City. It was founded in 1973 and describes itself as the world's largest LGBT synagogue"
Found a JVP Twitter post that happily recorded their obnoxious protests. Very proud "progressives". PROUD of their hatred for all things Israeli. Their controversy becomes the norm. 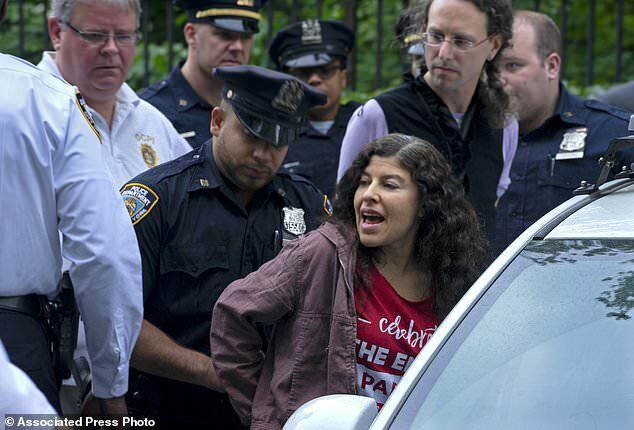 The PROGS are now accepted --- BUT ALSO ARRESTED! 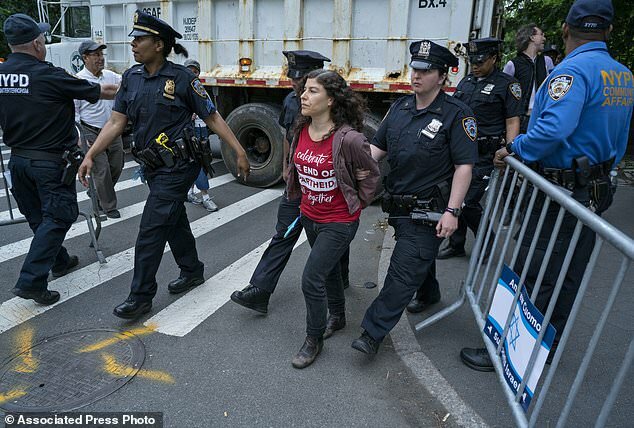 "Rosza Daniel Lang-Levitsky, one of those arrested for forming a blockade of New York Mayor Bill de Blasio and Jerusalem Mayor Nir Barkat at 65th and 5th Avenue, sought with this action to highlight the collusion between New York law enforcement authorities and those in Israel. 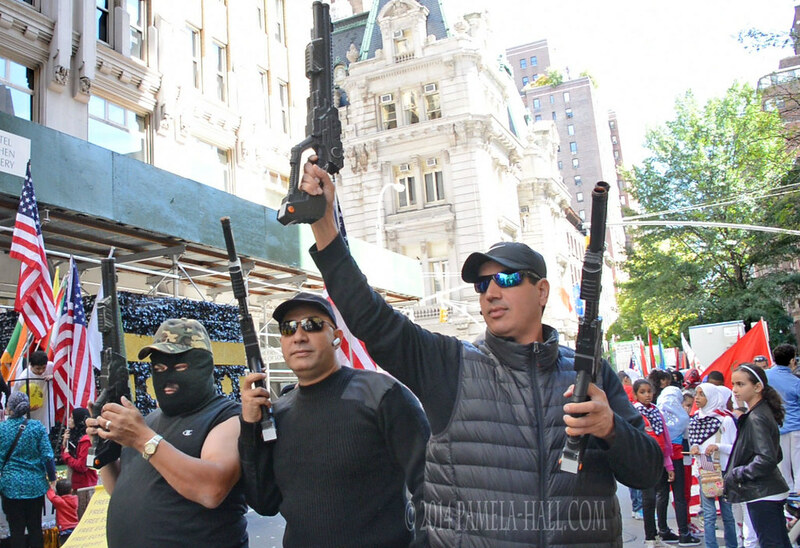 I end this report with a personal flashback re 10 years of covering the NYC MUSLIM Day Parade. Even though there were small protests in the beginning of my coverage, protestors with signs - confrontational info aka FACTS, that all ended a few years ago. Long gone after 4 years (maybe 5). Now, there is silence. Nothing. No protests. No signs. The controversy has morphed into acceptability. All things Muslim, Si. Israeli, NO! ... and plastic guns held high. That controversial year has predictably disappeared down the PC rabbit hole. But never the dedicated agitprop bent on destroying Israel. "... organizations dedicated to destroying Israel’s economy through boycotts, divestment and sanctions (BDS) being given the privilege of marching? “The New Israel Fund sees participation in the parade as a strategic step in being accepted as a Zionist organization, in spite of the fact that they have encouraged a boycott of products and companies in Judea and Samaria,” claimed Matan Peleg, CEO of Im Tirtzu."